Overwhelming proportion of European companies use euro pallet in their import and export businesses as euro pallet is the standard European pallet as specified by the European Pallet Association (EPAL). 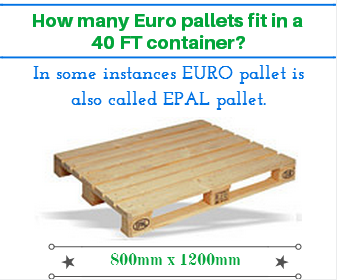 In some instances EURO pallet is also called EPAL pallet. Today I would like to explain you that how many euro pallets or EPAL pallets (800 x 1200 mm) you can fit into a 40 FT container. Today I would like to explain you that how many standard pallets or industrial pallets (1000 x 1200 mm) you can fit into a regular 40 FT container in one row loading plan? What are the dimensions of a standard pallet and what are the internal dimensions of a 40ft container? 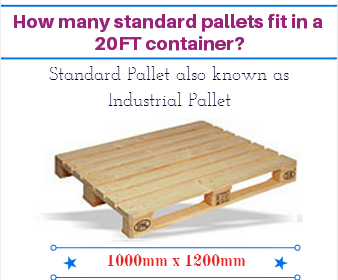 The dimensions of a standard pallet are 1000mm width and 1200mm length. If you are in USA you should use 39.37” width and 47.24” length. The internal dimensions of a 40ft container are 2352mm width and 12032mm length. If you are in USA you should use 7 feet 8 5/8 inch internal width and 39 feet 5 5/8 inch internal length. 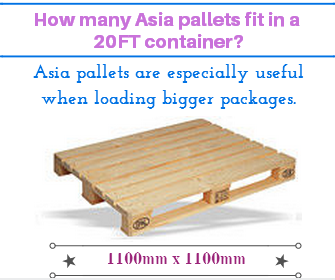 How many Asia Pallets (110 cm x 110 cm) fit in a 20FT container? Asia pallets have a square base area unlike rectangular size standard and euro pallets. 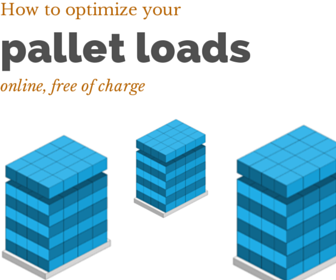 It is the 3rd most preferable pallet type which is used in international transportation. It is especially useful when loading bigger packages such as 220lt plastic barrels. You can fit 4 pcs of 220lt plastic barrels on to an Asia pallet. Today I would like to explain you that how many Asia pallets (1100 x 1100 mm) you can fit into a 20FT container in one row? 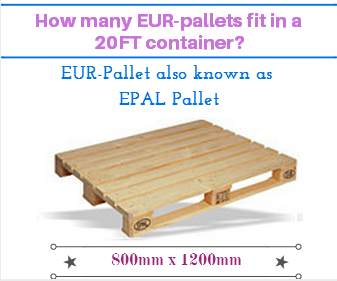 How many EUR-Pallets fit in a 20FT container? EUR-pallet is a type of pallet which is used in international transportation. It is the standard European pallet as specified by the European Pallet Association (EPAL). EUR-pallet is also known as EPAL pallet or Euro pallet. Today I would like to explain you that how many EUR-pallets or EPAL pallets (800 x 1200 mm) you can fit into a 20FT container in one row? What are the dimensions of a EUR-pallet and what are the internal dimensions of a 20ft container? The dimensions of a EURO pallet are 800mm width and 1200mm length. If you are in USA you should use 31,5” width and 47,24” length. The internal dimensions of a 20ft container are 2350mm width and 5900mm length. If you are in USA you should use 7 ft 8.44in width and 19 ft 4.17in length. How many standard pallets fit in a 20FT container? There are several pallet types available in the markets, which are suitable for international transportation. Some of the best known pallet types that are being used in international transportation are EUR-Pallet (800 x 1200 mm), standard pallets also known as industrial pallets (1000 x 1200 mm) and Asia pallets (1100 x 1100 mm). Today I would like to explain you that how many standard pallets or industrial pallets (1000 x 1200 mm) you can fit into a 20FT container in one row? In most cases exporters and importers know 20ft and 40ft containers but they are not familiar with 40Hq containers. Today I would like to introduce you the 40hq container by comparing its main features to the 40ft standard container. What does general purpose freight container mean? General purpose freight container is the most common container type used in global sea transportation. These types of containers are totally enclosed so that the goods inside the container have no contact with the outer environment during the carriage. They have rigid roofs, rigid side walls, rigid end walls and a floor. At least one of theirs end walls equipped with doors allowing easy loading and unloading of the goods. As said earlier they intended to be suitable for the transport of cargo of the greatest possible variety. As a result they are the most common freight container types in circulation. Should the container number be mentioned on the packing list? Transporting goods by sea in containers plays a very significant role in international trade. In the past 60 years, containers have become the primary means of transport of customer goods by sea. At the moment millions of containers circulated around the world every year. Tracking and tracing these containers is one of the most important security priorities of the custom authorities. Development of a standard container number system was a huge response to tackle the container tracking problem in international trade. With the help of the globally valid and standard container number, every share holder could trace and identify them fast. Container tracking system will be most effective when the container number is mentioned on the shipping documents. 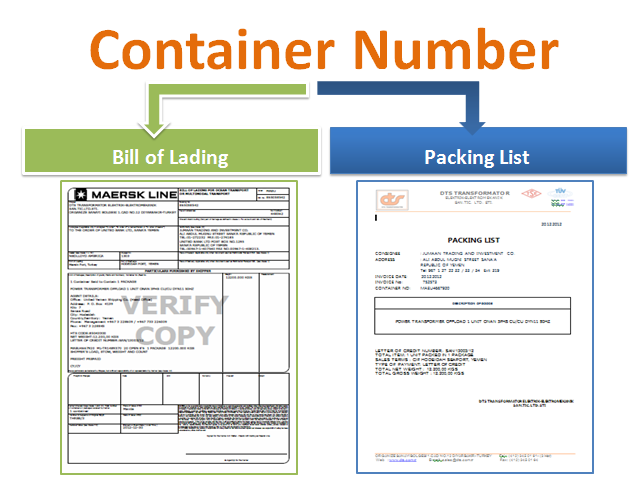 Container number is generally inserted on the bill of lading by carriers or their agents on behalf of the carriers as a standard sector practice. In most instances shippers also add container numbers on the packing list as well. But is this a requirement, a good practice or unnecessary information. What is a container number? If you are not dealing with a fraudulent transaction, you should be able to identify corresponding container number/numbers on the bill of lading as an importer. But what is a container number? What are the benefits of using a container number in international sea transportation? How to check a container number in order to make sure that the container number is valid and correct? On this article I will try to answer these questions. Let us start with the definition of the container number. What is Standard Carrier Alpha Code (SCAC)? As an exporter or importer you should have seen SCAC codes on the bills of lading. On this article I will try to explain the meaning of SCAC codes. After reading this page you should understand the key aspects of SCAC codes in international transportation. SCAC is the abbreviation that stands for Standard Carrier Alpha Code. Standard Carrier Alpha Code is a specific code used to identify transportation companies such as freight container carriers and forwarders. Each transportation company has its own Standard Carrier Alpha Code. What does “Said to Contain” (STC) mean on a bill of lading? Said to contain means that the shipper that has loaded the goods into the container has done his best to make sure that the goods which are loaded into the container are matching the description of goods stated on the bill of lading in a containerized shipment. Because of the fact that carriers could not know exactly what would have been loaded into the containers, they add this expression on the face of the bills of lading that they have issued in order to protect themselves. A carrier or a forwarder has no knowledge of the contents of the container unless the container is stuffed by the carrier, forwarder or their agents. The shipper that has loaded the goods into the container should take necessary steps to ascertain the contents of the container. "Said to Contain" or “STC” generally added to the description of the goods on the bill of lading. This term means that the content of a sealed container received by the carrier as is without any additions.